On April 19, 2017, about 1910 mountain daylight time, an Cessna 210 airplane, N9589T, impacted a fence and irrigation equipment during an off airport forced landing while on a visual approach to the Harriet Alexander Field Airport (ANK), Salida, Colorado. The private pilot was not injured, and the airplane was substantially damaged. The airplane was being operated by the pilot as a 14 Code of Federal Regulations Part 91 business flight. Visual meteorological conditions existed at the airport at the time of the accident, and no flight plan was filed. The flight originated from Page Municipal Airport (PGA), Page, Arizona, about 1700. The pilot was delivering the airplane to a new owner in Denver and was landing at ANK for fuel. She stated she flew the first hour and thirty minutes with the left fuel tank selected then she switched to the right fuel tank for the remainder of the flight. The en route portion of the flight was uneventful. She stated the fuel mixture was leaned during the flight and increased to full rich as she descended. She stated that she entered the ANK traffic pattern, turned onto base leg, and after leveling the wings, noticed "everything went quiet." She attempted to restart the engine with no success. Unable to make it to the runway, she chose a field in which to land. The airplane landed hard and contacted a fence and irrigation equipment during the landing roll resulting in substantial damage to the right wing. The ANK airport manager who assisted in removing the airplane from the field reported they drained 14 to 15 gallons of fuel from the right wing and about 1 gallon of fuel from the left wing prior to moving the airplane. An examination of the airframe and engine were conducted on May 5, 2017 at ANK. The upper engine cowling had been removed from the airplane. A visual inspection of the engine was conducted, and no impact damage was noted. The wings had been removed from the airplane during the wreckage retrieval. The airplane was moved from a hangar to an open ramp and secured. An examination of the engine was conducted during which the top spark plugs were removed and appeared to have normal color and wear signatures. The cylinders were examined with a lighted boroscope. The cylinder valves were intact with normal combustion signatures. Thumb compression was achieved when the propeller was rotated by hand. Both magnetos produced spark at the ignition leads and the impulse couplers released normally. A temporary fuel supply was connected to the right-wing fuel supply port and a bucket was placed under the right tank fuel return port. The fuel inlet b-nut was removed from the fuel manifold and the boost pump was turned on. Fuel flow was verified at the fuel delivery hose. The fuel inlet hose was reinstalled on the fuel manifold. Cylinder No. 5 fuel line was removed from the injector. The fuel boost pump was turned on and fuel flow was verified through the line which was subsequently reinstalled. The fuel system was primed, and an attempt was made to start the engine. This was performed twice and both times the engine did not start. The No.6 injector nozzle was removed, the boost pump turned on and it was verified that fuel was flowing to the injector nozzle. A third attempt to start the engine was successful and the engine was run at idle for several minutes to warm up. The throttle was then advanced, and the engine rpm responded accordingly. The fuel mixture was leaned to account for the high elevation. The rpm increased by 150 rpm and the engine began to run more smoothly. A magneto check was performed at 1,700 rpm and a 100-rpm drop was noted with each magneto. Engine power was increased, and the engine ran smoothly until the mixture was enriched at which time it began to run rough, although it continued to run. The engine power was then decreased to idle, the mixture control was moved to the cutoff position, and the engine stopped. It was noted that the exhaust gas temperature gauge was inoperative, and the cylinder head temperature gauge indicated a single cylinder value. The fuel gauge operated normally. The manifold gauge indicated atmospheric pressure prior to the engine start but did not operate during the engine run. The examination did not reveal any preimpact failures/malfunctions that would have precluded normal operation of the engine. 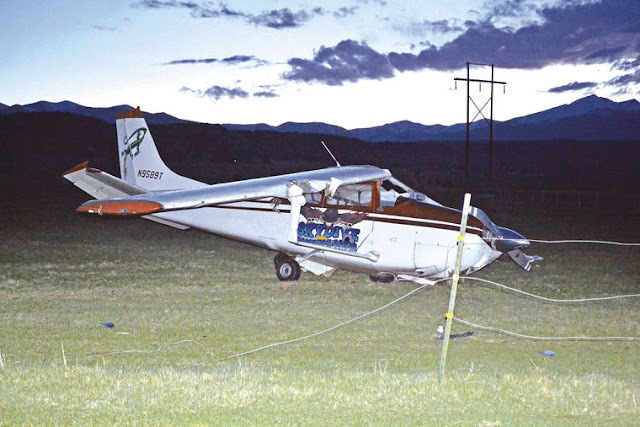 On April 19, 2017, about 1918 mountain daylight time, an Cessna 210 airplane, N9589T, impacted a fence and irrigation equipment during an off airport forced landing while on approach to the Harriet Alexander Field Airport (ANK), Salida, Colorado. The private pilot was not injured, and the airplane was substantially damaged. The airplane was being operated by the pilot as a 14 Code of Federal Regulations (CFR) Part 91 business flight. Visual meteorological conditions existed at the airport at the time of the accident, and no flight plan was filed. The flight originated from Page Municipal Airport (PGA), Page, Arizona. The pilot stated she was delivering the airplane to a new owner in Denver and was landing at ANK for fuel. While turning from base to final for runway 24, the engine lost power. The pilot made a forced landing in field where the airplane contacted a fence and irrigation equipment. Field elevation above 7500’. I learned to fly at 200’. My first time venture into high elevation airports was very interesting. After landing at Rock Springs, the engine quit running after touchdown. I was lucky. In order to get it to restart and idle, I had to lean in much more that I thought necessary. I have never forgot learning that.